We are always eager to hear interested singers. If you can read music and have a clear, strong voice..we want to hear you! Our trip to Italy in April 2012, was exciting and fun. We sang in Verona for the choral competition and also gave concerts there. Our hotel was at the edge of beautiful Lake Garda. During the second week of our trip, we traveled to Florence and gave a big concert that was sung with perfection. 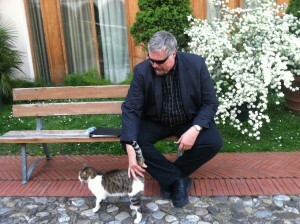 Robert loves this Italian cat!